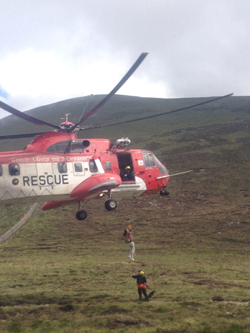 The Mourne Mountain Rescue Team responded to two hill walkers sustaining injuries on Slieve Donard. AT approximately 2pm today (Sunday 28 July) the Mourne Mountain Rescue Team were tasked to assist a casualty on the summit of Slieve Donard who had fallen and sustained head and facial injuries. The lady was walked to the col by a member of the team for an airlift by Rescue 116. At the same time a second cauualty sustained a knee injury while descending Slieve Donard and made her way to the col where she was also examined by a team member before being transferred to a stretcher and airlifted by Rescue 116. Both casualties were flown to Daisy Hill Hospital for further treatment. In total 10 members responded and the team stood down at 4pm.